Asafetida plant, Ferula assa-foetida, is also known as Hing, Food-of-the-Gods, Devil’s Dung. A giant steeped in tradition – used in ancient Greece and Rome as a spice. The roots yield a redolent gum resin that is the spice. Current use in Asia as a spice and a medicinal remedy. Traditional Ayurvedic use of the resin. The unpleasant smelling stalks and leaves are used as a vegetable, the unpleasant odour disappears when cooked. Native to the high plains of Iran and Afghanistan. 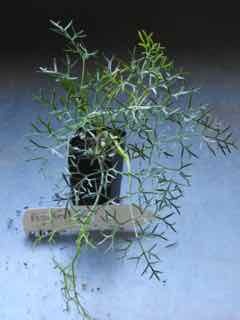 Asafetida plant is an herbaceous perennial with flowers to about 2.0m. Cold hardy. Prefers an open sunny position in soil with good drainage. Asafetida seed is available irregularly. Be the first to review “Asafetida, plant” Click here to cancel reply.